One of the highlights of my trip to the San Francisco Silent Film Festival was the musical accompaniment provided for The Docks of New York by Donald Sosin. Two weeks later Mr. Sosin was in Seattle, participating in the SIFF Film Center’s tribute to the Library of Congress Film Archive. I was happy to queue up to see (and hear) him again. The protagonist of The Man Who Laughs (1928) served as visual inspiration for the Dark Knight’s nemesis the Joker; Gwynplaine has had a rictus permanently carved into his face as punishment for his father’s crimes. 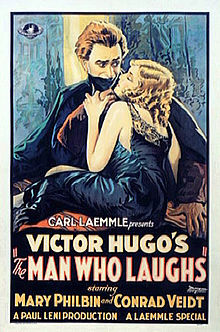 The opening minutes of the film based on Victor Hugo’s novel pack in an astonishing number of horrors as the now-orphaned boy butchered at the behest of a monarch rescues a blind baby from the hands of her dead mother as convicts swing from the gallows overhead. The adult Gwynplaine joins a troupe of players and capitalizes on his disfigurement as he strives to be worthy of his sightless swain’s love. When word of his noble lineage reaches the Queen, the poor fool becomes a pawn in a game he doesn’t comprehend. The film, directed by Paul Leni, is a propulsive mix of tragedy, fairy tale, and swashbuckler. Conrad Veidt’s performance as Gwynplaine is a marvel. Forced to grin maniacally no matter the circumstance, he conveys every emotion through his body language and desperately haunted eyes. Julius Molnar Jr. matches him playing the character as a child, barely capable of processing his fate but already knowing to feel ashamed. Marion Davies’ great misfortune is having her own life conflated with that of Citizen Kane’s talentless mistress. Yes, she had a decades-long affair with William Randolph Hearst, but confusing fact and fiction is akin to thinking of Orson Welles solely as a fat man who once voiced a mechanical planet. She was one of the first great screen comediennes, evidenced by 1928’s The Patsy. Davies plays the overlooked younger daughter who reinvents herself to nab her sister’s boyfriend. Her extended sequence aping other silent stars like Lillian Gish still garners big laughs. Mr. Sosin’s scores added to the films. During The Man Who Laughs he asked for – and got – audience participation, and his wife Joanna Seaton contributed gorgeous, ethereal vocals. The combination of semi-improvised live music and a heightened style of screen acting creates a hugely enjoyable hybrid experience that in some ways is more like theater. I’m afraid I’m hooked now.